Sarah Adleman C-IAYT, RYT-500, CBIS, MFA, is a Certified Yoga Therapist specializing in work with Traumatic Brain Injury. She earned a Bachelors of Art from The University of St. Thomas in Houston and a Masters of Fine Art from The University of Texas at El Paso. 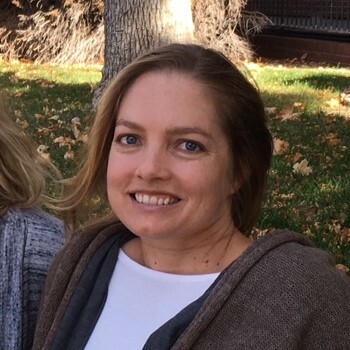 In 2006, she became a Registered Yoga Teacher 200hr with Integral Yoga and began working with TBI at Mentis Neuro Rehab Hospital El Paso in 2007 and has been CBIS (Certified Brain Injury Specialist) since 2013. Sarah earned her RYT500 with Integrative Yoga Therapy in 2015 and her C-IAYT (Certified Yoga Therapist) in June 2016. Sarah began working with O.T. Plus in 2017. She believes strongly in Yoga Therapy’s place at the table in TBI rehab and is excited and honored to build the Yoga Therapy program with the team at O.T. Plus. Sarah moved to Colorado in 2015 and although the bayous of Houston and the desert of El Paso will always hold the space of home, the mountains of Colorado now join the terrain. She loves being able to live and work in the urban setting of Denver while also being close to the mountains for trail running, hiking, snowshoeing, and the deep breath of nature. One of the most formidable experiences of Sarah’s life was living in Bangladesh as a Peace Corps Volunteer and in China as a English teacher. She continues to travel and experience different cultures whenever possible. When home, she satiates her desire through the spices and flavors of cooking as well as continuing her journey as a published author.